Comment: it is nice that musicians are still up to get inspired by benchmarks with regard to conquering of the outer space by the human race. Unfortunately there have been way too little space flights into the space after Yuri Gagarin and US astronauts did it. More profoundly, there is no qualitative progression to have been since then (it might be the reason why there are arising conspiracy theories about expressing doubts regarding the flight to the Moon in 1969 and thereafter, for instance). The flight to Mars seems to be very far away if not impossible altogether. Of course, it needs a huge amount of money to prepare it. On the other side, countries are rivalling with each other to spend their money to get economic, resource-related, and military advantages and the most worst one is that wasting resources and annihilating environment around us. As the human race we have no sole fist to realize our goals. By personal aspect I have no faith into it anymore. It might be the only aspect what we could realistically do for the cosmos is to protect our beautiful home planet Earth, the only genuine pearl that we have been having. The human being is way too stupid to reach it if he/she is not able to change the overwhelming economic order around him/her based on excessive, destroying consumption. The human being is still as clumsy as he/she was many deacdes ago in connection with curing such diseases as high-grade astrocytomas, pancreatic cancer, lung cancer and myeloma, for instance. This is a notch of our Mars which needs to be conquered. However, Armstrong by Livorno, Italy-based experienced electronic musician Massimo Ruberti is a pearl as well, though a sonic pearl. 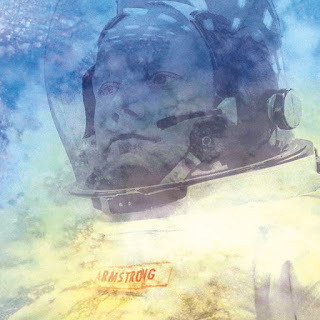 The titles of it reflect upon Armstrong`s stages to get into and to be in the outer space and landing on the surface of the Moon. By listening to it one could experience hyper-realistic emotions wherein dreamy,glacial-alike synth threads and glimpses used to intersect with the sounds of digital bug filled radio transmitters where the message of an astronaut coming out of it rings in a fabulous way. It is quite weird and funny that at the ending part of Moon Ruberti uses a mandolin induced motive that reminds of a Russian folklore ditty as if depicting Russians landed on the Moon instead of US-Americans. On the other side, maybe it is a try to consolidate two nations to have at least one goal to conquer the nearest planets. By regarding the example the Italian composer extends its scope beyond usual understanding of electronic music by using exuberant orchestrations and motives and rhythms in addition to ordinary package of electronic sounds. In a word, get this album, listen to it. Even if your optimism about space expansion will not be aroused those sounds and constructions respectively entering into your ear and brain give you a candidate for the list of the best albums in 2015.